In addtion to pottery, knitting is a chance to use color, pattern, tools and techniques in the service of a functional product. Knitting is handy when you need a portable project – e.g. when you’re recovering in bed, or have l-o-n-g waits for medical or vet appointments. I’ve become a more patient waiter since I started taking my knitting. I see the delay as an opportunity to indulge in something daily life doesn’t readily afford. Since my knee replacements, I always have a project on my needles. 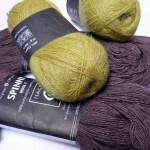 There is an amazing online, free group for needle arts, Ravelry.com. Like the ceramics community, it’s full of friendly people who have a need to make. It supports itself through ads, and provides a great free yarn and pattern database, and a place for people to post works, find out about yarn, share info with other knitters, and have interest-group discussions. There’s a Mystery Shawl Knit-Along with one of my favorite pattern designers, Stephen West, coming up, and waves of people signing up for the weekly pattern installements. One of the interesting things about knitting is that it’s very hard to monetize the product of hand-knitting. It takes HOURS and HOURS to make socks. No one can afford them if the maker demands a living wage. So, people often knit for themselves, or gifts for those they value. Certainly, the supplies can be monetized, but most of them are inexpensive items – nothing close to buying a wheel and a kiln. Like ceramics, there are technical things to know, and process to deal with and from which to draw inspiration. Some days it’s a relief to know if you like the way something looks, and know you won’t have the alchemy of firing to deal with.